Israeli soldiers killed, Friday, one Palestinian, and injured at least eight, including a medic and a photojournalist, during the Great March Of Return processions in the besieged Gaza Strip. The Health Ministry said two of the wounded suffered life-threatening injuries. 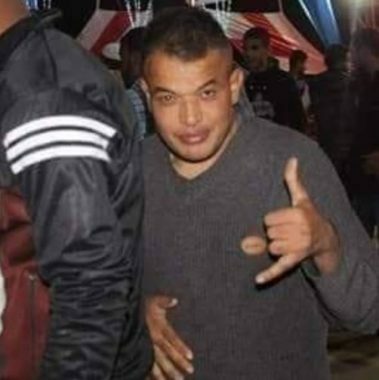 Dr. Ashraf al-Qedra, the spokesperson of the Health Ministry in Gaza, said the soldiers fired dozens of live rounds, high-velocity gas bombs and concussion grenades at the marchers, killing a young man, and wounding eight others. 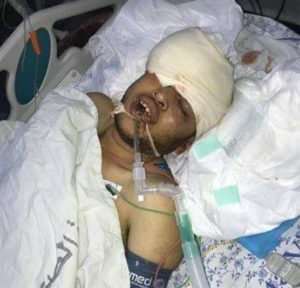 Dr. al-Qedra stated that the soldiers killed Karam Mohammad No’man Fayyad, 26, a disabled Palestinian, after shooting him with a live round in the head, east of Khan Younis, in the southern part of the coastal region. The soldiers also shot eight Palestinians with live ammunition, including a child who was shot in the neck, a journalist and a female medic, along the perimeter fence areas, in the eastern parts of the Gaza Strip, as the Great Return March processions continue for the fortieth consecutive week. The Palestinian Red Crescent Society (PRCS) said the soldiers fired a barrage of live rounds, rubber-coated steel bullets, in addition to high-velocity gas bombs and concussion grenades, especially east of Gaza city, al-Boreij refugee camp, Khan Younis and Rafah. It is worth mentioning that, since the Great Return March procession started in the Gaza Strip, the Israeli army has killed at least 190 Palestinians, and injured more than 25,000 others. No Israeli soldiers have been killed by Palestinian demonstrators participating in the ‘Great March of Return’ that has taken place each Friday since March 30th. According to the United Nations Office for the Coordinator of Humanitarian Affairs (OCHA), a total of 295 Palestinians were killed and over 29,000 were injured in 2018 by Israeli forces. This is the highest death toll in a single year since the Gaza conflict of 2014 and the highest number of injuries recorded since OCHA began documenting casualties in the oPt in 2005. About 61 per cent of the fatalities (180 people) and 79 per cent of the injuries (over 23,000) were in the context of Gaza’s ‘Great March of Return’ demonstrations by the fence. Across the oPt, 57 of the Palestinian fatalities and about 7,000 of the injuries were under 18 years of age. At least 28 of the Palestinians killed by Israeli forces in 2018 were members of armed groups in Gaza and another 15 were perpetrators or alleged perpetrators of attacks against Israelis in the West Bank. A total of 14 Israelis were killed during the year by Palestinians and at least 137 others were injured. While the number of fatalities is nearly the same as in 2017 (15 people), the proportion of civilians among these fatalities (50 per cent) increased compared to the previous year (27 per cent).